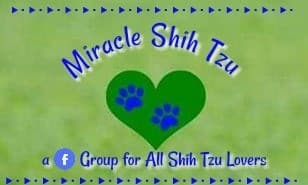 When we say house train a Shih Tzu, we are referring to housebreaking, house training, crate training, and potty training -- basically all mean the same thing but might have different meanings to different people. As with all training that we do, we believe in positive, gentle approaches that do not include harsh punishment. House training or housebreaking, a new puppy is by far the most important time investment that you can make in your new family member. A well trained and potty trained puppy becomes a true family member and a beloved and trusted companion. More dogs find their way to pounds and rescue agencies each year because they never mastered pottying in the place deemed appropriate by their owner. You don’t want to consider that option for your cute ball of fur. Before we discuss the ins and outs of house training, its important to understand that puppies have very small bladders and when they have to go, THEY HAVE TO GO. It is so very similar to potty training a two year old. For everyone knows, you don’t tell your two year old daughter who just started using the potty to wait until the commercial comes on to go to the bathroom. It is exactly the same with puppies. A puppy should be started on house training the minute you bring him home. Does he understand what to do? Will he cooperatively pee and poop where you tell him? The answer is simple: Probably not! All first attempts are more or less ways to help you manage the mess, but sooner or later, he will catch on and take some responsibility for his accidents, but not at first. House Train a Shih Tzu: Observe! For house training or housebreaking to be successful, the single most important thing that a new owner must learn to do is observe their puppy. This does not sound very hard; after all, what is more charming to watch than a new puppy! Puppies display tell tale signs that they are interested in eliminating. To house train a shih tzu, you need to pick up on their body language. With that said how many puppies get into trouble for leaving little surprises all over the house, chewing their owner’s shoes, or eating interesting things found in the cat’s litter box? Observation is so important—simply being around the puppy is not enough. Puppies are very good at telling us things and that is what we need to notice in order to train. Since we can’t watch a puppy 24/7, we have some options that include confinement and crate training. Two decisions you will need to make before embarking on house training or housebreaking are location and words to use. First decide where you want the puppy’s bathroom to be. Most choose a location outside, but it could be indoors on puppy pads or even a dog litter box which is useful for those who live in apartments or condos and do not have immediate access to the outdoors. Whichever location you choose, it is important to be consistent. Deciding that your dog should go outdoors, but provide a pad indoors for those times that you can’t take him out sends a confusing message to your dog and makes house training more difficult. Secondly, it is important with any training to have words to use that the puppy will understand. Just as we teach the word, “sit,” we also need to use a word command for elimination. Decide ahead of time what that word will be. Remember you will be using this word or phrase in public, so make sure what you decide to say will be comfortable to you. I like to say, go pee-pee and poop-poop, but I’m a mom and an early childhood educator, so these words are comfortable for me. You might say, “do your business, or go potty, or do your duty,” whatever works for you. Restrict the area where puppy is allowed to go. Small rooms with toddler gates work well when you are not directly interacting with your puppy. Alternately, some prefer to use the tether or umbilical method to keep the puppy under observation. This involves attaching one end of a leash to the puppy and the other to you, either to your belt or your wrist. You have the puppy with you at all times, so it is easy to tell if the puppy needs to eliminate. How do you tell? All dogs have body language that can be observed by their humans. A puppy that needs to urinate or defecate will begin to sniff the floor and walk or run in small circles, whine or begin to squat. Any of these signals indicate the puppy is ready to go and should be taken to the designated area. Arrange your schedule so that you will have time to train your pup. Plan on at least a weekend of nonstop house training! Regular feeding schedules help speed up the process of house training. 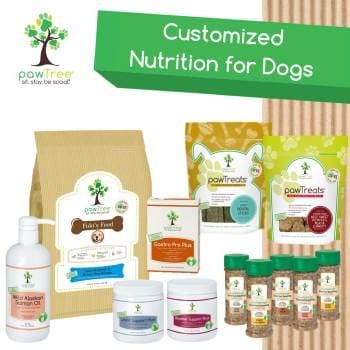 While it is convenient to provide food all of the time, regular meal times are preferable for putting the puppy on a regular elimination schedule. Water should be available for dogs at all times, except during the night. At first when you house train a Shih Tzu, you might discover that nighttime can be problematic because many small puppies cannot sleep through the night without the need to go. This means getting up in the middle of the night to take your puppy out.You might be able to restrict this behavior to some extent by feeding late in the afternoon or early evening and taking your puppy out several times before bedtime. Some equate the acquisition of a new puppy to that of a newborn and there is much truth to this. If getting up in the middle of the night does not appeal to you, then you must make an acceptable place where the puppy can use to eliminate. This usually means confining the puppy to a small area using an exercise pen or x-pen and place wee-wee pads where you want him to eliminate. Many people use crates to train their puppies. A crate is a type of enclosure with four sides, a top and a floor. Most crates have one or two doors that can be used by your puppy to enter or leave. There are many uses of crates. Can be used to protect a puppy from dangerous household items such as poisonous plants, electrical cords, medicines, etc. 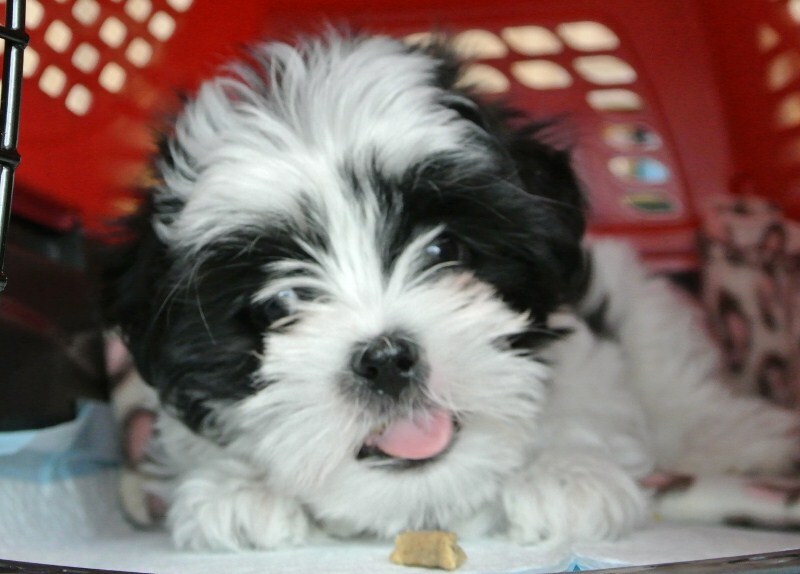 To House Train a Shih Tzu, most people will opt for the Crate Training Method. Most puppies learn to love their crate and look at it as their safe home. Most puppies feel very secure in their crate and will go in it whenever they want to sleep or get away from the normal commotion of a busy household. For the purposes of this article, we will assume that you have already introduced your puppy to its crate and they feel secure in going in and out of it. Please check out the tips below if you are having difficulty getting your puppy to go to his crate. The notion about using crates as house training tools lies in the fact that instinctively dogs do not want to soil their den or nest. This goes back long before the first dog was domesticated. Crate training is very popular and an effective method of house training. The puppy will not want to mess where he sleeps so he will learn to wait until he is released from the crate. Naturally you will not want to confine your puppy to its crate for extended periods of time. Remember a young puppy cannot go much beyond 2 hours during the day before they need to eliminate. They can however go longer at night while asleep. This makes sense. Think about the average person. We may use the bathroom several times during the day, but sleep all night without getting up to visit the restroom. If the crate is large enough for the puppy to stand up, turn around, stretch out and lie down, it is of sufficient size and the puppy is not likely to mess in it provided it does not have to remain in it for extended periods of time. Crates should be big enough to stand up, turn around, lay down and stretch out. To teach him to enter the crate, toss a treat in and praise him when he goes after the treat. Decide on the word you want to use to lure your puppy into the crate such as "go to your crate, go to your bed, crate time" Repeat the dog's name and then the command; praise and offer a treat when he goes inside the crate. What if you work and cannot let the puppy out? It is cruel to keep a puppy confined to a crate all day. Accidents will happen because the puppy will not have any other option. The purpose of the crate is lost, if the puppy begins to soil in it. If you cannot be available, there are several options. One method is to purchase a crate larger that is currently needed, assuming that your puppy will grow. Place blankets, mats or other bedding one side of the crate and line the other side with puppy pads or newspaper. This will allow the puppy to remain clean on the sleep side. Another option is to place the crate in a tiny room or block off a section of a room with a wire pen called an exercise pen or X-pen. The door to the crate remains open and the puppy can go in and out as needed. There is room within a small x-pen to place food and water dishes, a crate and a section of newspaper. A crate is a wonderful tool if not abused to house train a Shih Tzu. The puppy learns that it is their special place and will gladly go into it to sleep or nap. Children should be cautioned to avoid disturbing the puppy when he is in his crate. Never corner your pet in their crate to give it medicine, groom, punish, or anything else that would create an association in the pup’s mind between distress and its crate. It has to remain a safe, tranquil place that belongs to the pup and the pup alone. Watch the puppy closely for signs: (sniff around, circle, arch back, then take him outside. Use the words you have choose, "Abby, go pee pee"
If the puppy doesn't do anything after 10 minutes, take him inside and put him in the crate for about 15 minutes. Take him back outside and repeat the process. Use a leash at least part of the time; you will want to make sure your puppy knows he can eliminate while walking on a leash. Take him on an outing and praise him when he eliminates; Remember to clean it up. You will want your puppy to know he can eliminate in places other than home. Does Your Shih Tzu hate going outdoors in the rain? This in a nutshell is how to house train a Shih Tzu. If nothing goes wrong and no problems arise, you are home free! In the real world, however, problems do arise. But before you call it a problem, remember that toy breeds are notoriously difficult to house train. It make take from several weeks to several months to house train a Shih Tzu. If you work outside the home, the process may take longer. 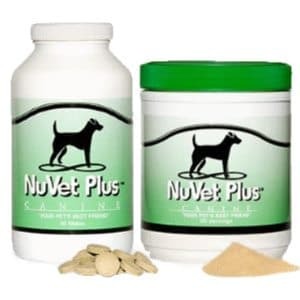 Common problems that most owners face include resistance to going outside, often due to bad weather, playing outdoors instead of eliminating, diarrhea, accidents in the house, and coprophagia. Older puppies may also display submissive urination, marking, or excitement urination. Puppies that have been well socialized love to go outdoors, but certain weather conditions may create some finicky pooches. Resistance to the outdoors may have other causes as well. Most puppies love the outdoors so much that they forget why they have been taken out and choose to play inside. 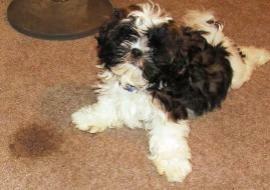 But there are some simple strategies that can employed that reduce this problem and help you house train a Shih Tzu. Is it just too cold. Check out our Cold Weather Advice for more information. Accidents in the house can have multiple causes and some re-training might be needed. At first, expect accidents and be sure to have plenty of cleaning materials handy. The best way to handle accidents is not to overreact. The old methods of hitting a dog or rubbing his nose in the mistake are not only inhumane but ineffective as well. If you can catch your puppy in the act, say something like, uh oh, woops, and take him outside. If he continues to eliminate outside, praise and give a treat. Clean up any accidents. Soak up all liquid and clean thoroughly with a pet enzyme cleaner. Coprophagia is term given to a condition in which a dog eats its own excrement. While not exactly a house training problem, we've listed it here because it does come under the category of elimination. AND, it is a common problem in this breed. Most people find this disgusting, but it might surprise you to know that it is unlikely to harm the dog. There are many reasons for this behavior and some methods for eliminating it as well. For more information, please visit our page, Coprophagia. Both males and females mark. The higher the ranking of the dog, the more likely they will mark. Unaltered adults will mark more than neutered or spayed dogs. Unaltered females will mark just as much or more than neutered males, if there are other dogs in the household. The favorite places for males to mark are table legs, door frames, corners of a chair or sofa. Females often squat as if to urinate, but instead mark with just a small amount of urine. Clean up is essential and preventing the dogs from their favorite areas sometimes helps. Scolding or punishing will not work. Sometimes taking the dog outdoors, so they have more opportunities to mark helps a little, especially if they are willing to mark their territory outdoors. Crating helps, but it is unfair to keep a dog crated all the time. Sometimes the only way to save the furniture and carpet is to invest in some belly bands for male dogs and doggie diapers for females.